Description: 30T has changed crews and is now ready to depart the south end of East Binghamton, 84 cars trailing the three CN units. Description: 31T rolls out of the Canisteo valley behind the usual mix of CN power. There used to be two tracks here til Conrail single tracked the line west of Waverly in 1992. Description: I caught this 31T rolling west out of Binghamton as it left QD and rolled its 107 cars across the Chenango River. It was one of those glorious sunny days in the Tier, made for a chase. I made the best of it, following this train to Dalton, almost 140 miles to the west. Description: This was the last shot I got of that 31T. West of Hornell, he really took off, and I had a hard time keeping up, since he had 50 MPH, and I had to get through Canisteo and Hornell, a challenge to start with, then deal with 40 MPH at Arkport, 30 at Canaseraga, and hope to stay close. I beat him here, but that was the end. I could have beat him to Silver Springs, but it was getting late and I had to be at work the next morning by 6. Description: 31T crosses the Chemung River, as seen from the park on Water St. This was always a good location, but if you shot him at Waverly, you had to run to get it. If you shot him at Chemung, you really had to hustle, and hope you made the lights in Elmira. Description: 31T crosses the Chemung River at Elmira with 117 cars. Must have rained a lot recently-not a stretch, seems like its ALWAYS raining in the Southern Tier!! The water is high-normally you can almost walk across the river bed here. Description: There had been a washout near this location several years prior, and the track had all been rebuilt. 31T is taking advantage of the new track, though the curvature in the valley is such that it wont make a lot of speed anyway. The view shows why this is such a great place to shoot train photos. Description: The reason for the name should be obvious!! 31T rolls through the curve near West Cameron, passing MP 316 as it heads toward me. Description: A striped CN unit leads 31T and 107 cars this day past the model railroad building set at Waverly. Description: In the mid 1990s, Conrail single tracked the Tier west of Waverly. We see 31T coming off the double track, passing the eastbound home signal, and rolling for Elmira. 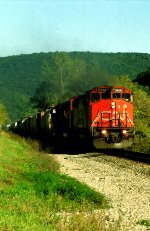 Title: CN 5690 with an eastbound freight passing the VIA depot. Description: CN #5690 at CN Nichoals Yard. Description: CN Bala Subdivision near Zephyr, Ontario.